The body compensates low oxygen availability by increasing red blood cell production, decreasing the binding affinity of haemoglobin and by increasing breathing rate. Why should the haemoglobin binding capacity decrease at high altitude? I think it should increase for better oxygen transfer and uptake from air. The concentrtion of oxygen in the atmosphere decreases with height. Hence, if the haemoglobin binding increases, we will be able to draw more oxygen from the air and transport it to the cells. Haemoglobin's job is to transport oxygen and not store it. Therefore it should also be able to release oxygen effectively. When the differences in partial pressure of oxygen between the tissues and blood are low then oxygen will not be transported to the tissues from blood, leading to hypoxia. 2,3 Bisphosphoglycerate (2,3-BPG) stabilizes the T- (taut; oxygen unbound) form of haemoglobin thereby reducing its affinity to bind to oxygen. 2,3-BPG is found to be elevated in people living at high altitudes. The production of 2,3-BPG is controlled by a negative feedback (Mulquiney et al., 1999; also see wikipedia) so that it does not overdo its job. David's answer explains the dynamics in details and addresses the non-linear (sigmoidal) nature of Hb-Oxygen binding which is a critical point for understanding how the effect of 2,3-BPG is actually favourable. However, haemoglobin content also increases so that higher amounts of oxygen can be captured. This is a fine balance and as you may notice (even if you do not read it to great depth) in the linked paper, there are many mechanisms that are working towards this. The answer to this question is yes, a decrease in oxygen affinity will decrease the oxygen taken up by the haemoglobin (Hb), but it is an appropriate response because it will have a greater effect in increasing the release of oxygen to the tissues. This is not intrinsically obvious. It happens because of the (sigmoid) shape of the oxygen binding curve, and can only really be appreciated if you examine the curves for the normal situation and that in which there is increased 2,3 Bisphosphoglycerate (2,3-BPG) producing the change in oxygen affinity. I have devised a figure to demonstrate this, although it is not based on actual data, so should only be regarded as illustratative. At sea level the lungs pick up oxygen at 1 (say 100% saturation of Hb) and when the oxygen pressure drops to 40 mm Hg in the tissues (2) the Hb will be 55% saturated. Hence in this example they have released 45% of a full complement of oxygen. 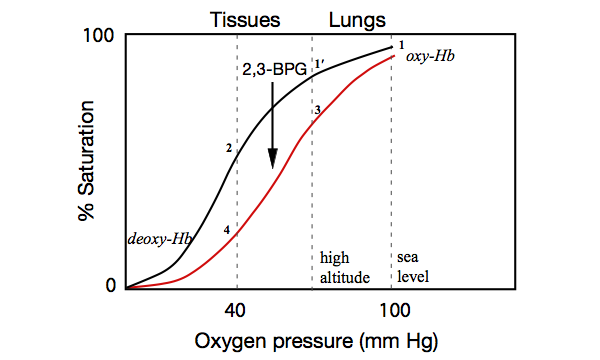 If we look at the same curve for high altitude, in this example the oxygen pressure at the lungs (1') will be such that the Hb is only 80% saturated. Thus at 40 mm Hg in the tissues (2) when Hb is only 55% saturated it will only have released and made available 25% of a full complement of oxygen. Now consider the effect of high altitude acclimatization with increased 2,3-BPG production changing the equilibrium and the oxygen binding curve (red). At the lungs (3) the Hb will be less charged with oxygen — only 70% saturation — but at 40mm Hg in the tissues (4) it will be much less saturated than on the black curve — 30%. Thus it will have made available 40% of a full complement of oxygen. This is not a perfect solution, which is why over a longer term there is increased production of red blood cells to provide more haemoglobin to compensate for the smaller amount of oxygen it can bind. Not the answer you're looking for? Browse other questions tagged biochemistry physiology hematology haemoglobin or ask your own question. Why does the affinity of haemoglobin for oxygen increase at higher elevations? Does the oxygen concentration equilibrate between red blood cells in the liver sinusoids? How much does donating blood affect the amount of oxygen in your blood stream at high altitude? Do High Triglycerides Invalidate Tests for Infections? Why does uncompetitive inhibition decrease the Michaelis constant? How does one experimentally obtain a hemoglobin-oxygen dissociation curve? If during exercise the affinity of oxygen for haemoglobin is decreased, what are the general consequences for tissues?